At the offices of Stefan Coleman, we focus on protecting the rights of consumers through class actions. Sometimes businesses take advantage of consumers in a way that would make it economically unfeasible for any single consumer to stand up and protect his consumer rights against the guilty company. However, at the Law Offices of Stefan Coleman we empower the consumer to hold the offending companies accountable for their actions through class actions. Class actions allow consumers to band together and hold the offending company responsible for their actions and for each consumer to receive compensation proportionate to the damage caused by the company. Instead of each consumer having to bring a separate individual action against the company, the class action allows for a single case to adjudicate the conflict brought by the consumers against the offending company. At the Law Offices of Stefan Coleman, our primary work is spent addressing consumer concerns and helping them to obtain relief from companies that are violating their consumer rights. 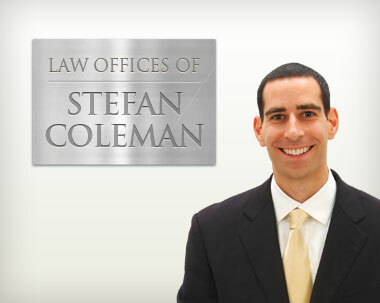 We work on many different types of cases at the Law Offices of Stefan Coleman. We work on privacy rights cases where people’s sensitive data such as credit cards and medical information has been leaked, stolen, or sold without their consent. We also work on cases where consumer’s Internet browsing, Internet shopping, address books, and emails are being tracked, leaked, or sold without the consumer’s consent. We are also working on cases where companies are recording your phone calls or calling your landline or cell phone without your consent. In addition, we work on cases where Internet shoppers are being misled and upsold on Internet websites. Finally, we also work on defective product cases where the product that purchased doesn’t work as advertised. We also work generally on unfair and deceptive business practices cases. Protecting consumers’ rights is the heart of our practice. If we can serve you in any way, please give our office a call.